EchoStar XV is a new direct broadcast satellite (DBS) which is being built for EchoStar Orbital Corporation II, a subsidiary of EchoStar Communications Corporation. Based on SS/L's 1300 platform, EchoStar XV will provide expanded services and flexibility for DISH Network's more than 13 million direct-to-home (DTH) television subscribers. Image courtesy of SS/L. SatNews — On July 11, 2010, International Launch Services has scheduled their launch of the EchoStar XV communications satellite, which translates to July 10 at 2:40 PM EST in the US. 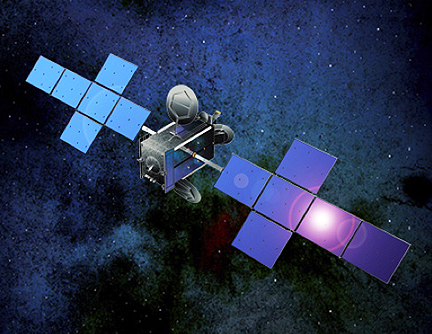 The EchoStar XV satellite will join DISH Network’s fleet of satellites that serve more than 14 million satellite TV customers in the U.S.
From its location at 61.5 degrees West, EchoStar XV will provide Ku-band services over the eastern continental United States. Customers have access to hundreds of video and audio channels, the most HD channels, the most international channels, state-of-the-art interactive TV applications, and HD and DVR technology, including 1080p Video on Demand. The satellite will pack 32 Ku-band transponders and has an anticipated service life of 15 years. The satellite will be launched into orbit via a Proton M/Breeze M, which will life the 1,554,000 lb spacecraft heavenwards from Launch Pad 39. The satellite was built by Space Systems/Loral on that company's 1300 bus. The first three stages of the Proton will use a standard ascent profile to place the orbital unit (Breeze M upper stage and the EchoStar XV satellite) into a sub-orbital trajectory. From this point in the mission, the Breeze M will perform planned mission maneuvers to advance the orbital unit first to a circular parking orbit, then to an intermediate orbit, followed by a transfer orbit, and finally to a geosynchronous transfer orbit. Separation of the EchoStar XV satellite is scheduled to occur approximately 9 hours, 13 minutes after liftoff. Follow the action at the live webcast, which will start approximately 30 minutes prior to liftoff. Or, watch the launch live on DISH Network's channel 101.